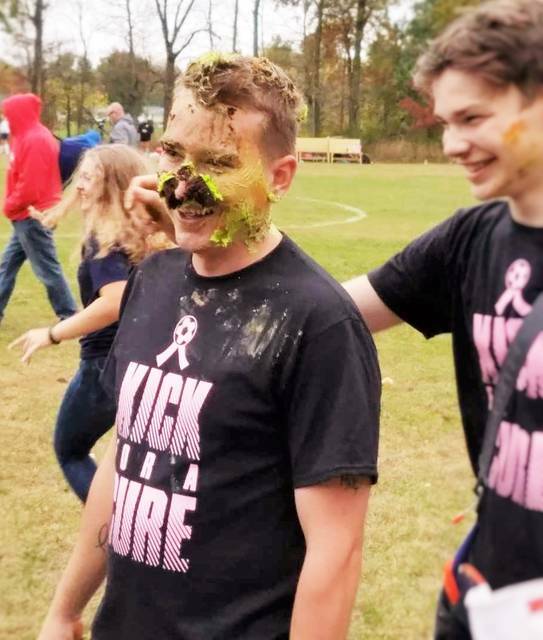 Chad Clinger | Galion Inquirer Galion head coach Eric Palmer was greeted with a cupcake attack after his Lady Tigers defeated the River Valley Lady Vikings on Thursday in the Kick For A Cure game. GALION — The Galion Lady Tigers soccer program hosted the River Valley Lady Vikings on Thursday evening for their final regular season game of the season. Thursday’s Mid-Ohio Athletic Conference match-up was also the Kick For A Cure event, complete with t-shirt sales, a bake sale and a 50/50 raffle and all proceeds going to breast cancer awareness research. For the second time this season, the Lady Tigers came away with a victory, defeating the visiting Lady Vikings by a tally of 1-0. With the victory, Galion finishes the regular season at 2-13 overall and 1-8 within the MOAC. AJ Nickels scored the lone goal for the home team with just over a minute to go in the first half of action. Nickels goal came shortly after River Valley was awarded a penalty kick but was unable to convert the opportunity as Dru Singer came up big in the box with the save. “There was a huge shift in momentum after Dru’s save,” states Galion head coach Eric Palmer. “The girls played at another level after that, AJ’s big goal and just the determination of the defense got us this win tonight,” finished Palmer. Although the Lady Vikings controlled the ball throughout most of the first half, Galion’s goal was able to distance them enough for the win and the defense was able to prevent many shots on goal by River Valley. When the shots were taken, Singer made sure that none were able to find the back of the net. The home match against the Lady Vikes was the third so far of the week for the Lady Tigers. On Monday, Oct. 9, they traveled to Delaware and were upended by Buckeye Valley; 6-0. Galion faced off against the same River Valley team but on the road on Tuesday evening and were defeated by a final of 3-0. Now that the regular season is over, the Lady Tigers will play their fourth match of the week and first of the postseason on Saturday, Oct. 14 at 5 p.m. Galion will head over to Mansfield to meet up with the Mansfield Christian Lady Flames in the opening round of the sectional tournament. The Tigers enter the brackets as the No. 13 seed while the Flames claim the No. 3 seed. https://www.galioninquirer.com/wp-content/uploads/sites/38/2017/10/web1_Coach-Palmer.jpgChad Clinger | Galion Inquirer Galion head coach Eric Palmer was greeted with a cupcake attack after his Lady Tigers defeated the River Valley Lady Vikings on Thursday in the Kick For A Cure game.